The Yaesu FRG-100 receiver provides the performance of a quality communications receiver at an affordable price. The "Frog" tunes continuously from 50 kHz to 30 MHz in CW, SSB and AM modes (FM mode with optional #0816). The latest microprocessor technology is used to merge performance and reliability with easy operation and functional simplicity. The FRG-100 incorporates features that both the casual and serious shortwave listeners will appreciate. Reception modes and most receiver functions are push-button selectable from the front panel. A crisp back-lit LCD with adjustable brightness provides frequency read-out and important operational status at a single glance. 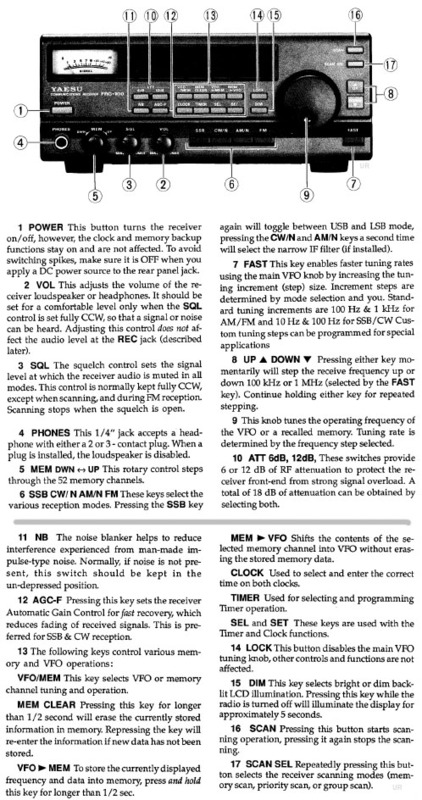 Selectable tuning steps of 10 Hz, 100 Hz and 1 kHz are standard, with other tuning steps programmable by the user. Fifty tunable memories store frequency, mode and filter information. Two additional memories provide band-edge information used for scanning. 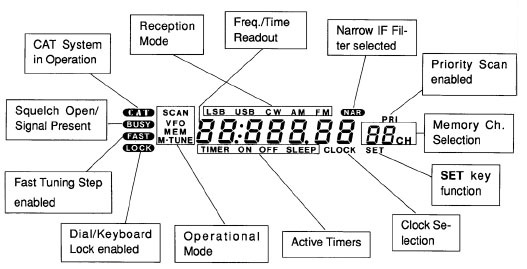 The FRG-100 has programmable 12/24 hour clocks and sleep timers to enable you to automatically switch the receiver on/off to record your favorite broadcasts. Multi-function scanning (memory, band, selectable group or priority) with carrier or time-delay is supported. A special broadcast band mode enables convenient selection of 16 pre-programmed international broadcast bands. The FRG-100's adjustable SSB carrier offset permits you to custom tailor the receiver's audio response. CW enthusiast will enjoy the reverse BFO offset and selectable CW sideband. Installation of the 250 or 500 Hz narrow filter further enhances CW reception and interference rejection. Other features include adjustable AGC, RF attenuator, noise blanker, all-mode squelch, and signal strength meter. 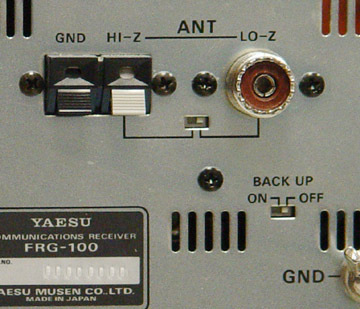 The Yaesu CAT system provides a direct link to the CPU in the FRG-100, allowing a personal computer with the optional Yaesu FIF232C CAT interface. This can provide computer controlled customized scanning and remote control of most receiver functions. The rear panel also features switch selectable antenna inputs for coaxial (SO239) or wire antenna lead-in. 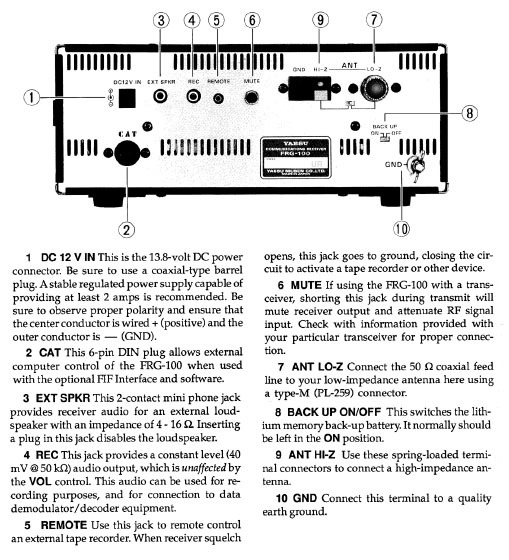 There are also jacks for external speaker, record out and mute. [Initially produced in August 1992. Production after November 1993 is informally referred to as the FRG-100B reflecting improved selectivity in two of the three filters]. Copyright 2000-2018, Universal Radio, Inc.